This page allows you to edit the structure and properties of tables of contents. You can modify and visualize the structure and order of elements in a table of contents using the Table of Contents section. This section occupies the left-hand portion of the editor area. You can modify the properties of specific elements in the Table of Contents by using the corresponding Details sections. These sections appear in the right-hand portion of the editor area depending on the type of element selected in the Table of Contents section. Visualize and modify the structure of a table of contents via addition, removal and reorganization of its elements. Activate the corresponding Details section used to edit the properties of a specific element in the table of contents. Find and open existing documentation pages and tables of contents linked from this table of contents. The table of contents tree viewer field displays the structure of the table of contents as it will appear in the Help system. This tree viewer allows you to modify the structure of the table of contents by reorganizing existing elements or adding new ones to the tree. The book element is the root element of a table of contents. Select this element to activate the Book Details section. Topics serve as links to Help files, as well as containers for other elements in the table of contents. Select a topic to activate the Topic Details section. Links allow you to include elements from other tables of contents in your table of contents. Select a link to activate the Link Details section. Anchors allow other tables of contents to specify that their elements will appear in your table of contents. Select an anchor to activate the Anchor Details section. Click on the Add Topic, Add Link or Add Anchor buttons in order to add a new topic, link or anchor to the table of contents. These actions are available when any element is selected. If the selected element is a book or topic element, the new element will appear as the last child of the selected element. Otherwise, the element will appear immediately after the selected element. You can also create topic elements by dragging HTML files and dropping them on the desired location within your table of contents. The newly added topic directs the user to the dropped page. Similarly, you can create link elements by dragging XML files representing tables of contents and dropping them on the desired location within your table of contents. The newly added link will reference the dropped table of contents. Click the Remove button to remove an element from the table of contents. This action is available for all elements except the book element. Note that, in order to maintain the validity of a table of contents, a topic cannot be removed if it is the only direct child of the book element. Click the Up button to move an element up one position with respect to its siblings. This action is available for all elements except the book element. Click the Down button to move an element down one position with respect to its siblings. This action is available for all elements except the book element. You may also move elements within a table of contents by dragging them and dropping them in the desired locations. To open the documentation file specified by a table of contents or a topic, simply double-click on it. To reveal the documentation file in a resource view, simply right-click the	element and select an option from the Show In submenu. To open the table of contents specified by a link, simply double-click on the link. To reveal the table of contents	in a resource view, simply right-click the link and select an option from the Show In submenu. The Book Details section allows you to edit the name, page location and anchor path of this table of contents. Edit the Name field to specify the name of the book. Edit the Location field to specify the location of a page associated with the book. This page will appear when the user clicks on the book element in the Help Contents window. If no page is specified, a default Help page is automatically generated by the Help system at runtime. The Anchor field allows you to specify if this table of contents will be embedded within another table of contents. The anchor field takes the path to a table of contents and the ID of an anchor contained in that table of contents, separated by a '#' symbol. When users view the referenced table of contents in the Help Contents window, the contents of this table will be displayed at the location of the specified anchor. 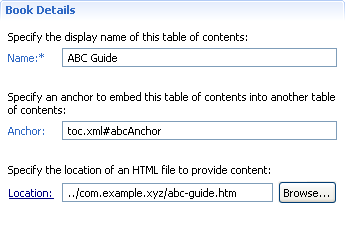 If the path specified in the Location field refers to an existing HTML page, then clicking on the Location hyperlink will open the page in a default editor. If the path refers to a file that does not exist, or if the path is empty, then clicking on the Location hyperlink opens a New Page Wizard, which allows you to create HTML pages. In the wizard, the File name field is automatically populated with the file name from the Location field (if specified). If a valid folder path is specified in the Location field, then this path is automatically selected in the wizard as the location of the new file. Click the Browse button to open the Page Selection dialog, which allows you to select an existing HTML page. The dialog presents a hierarchical view of HTML pages contained within your workspace. After a selection is made, the relative path from the project that contains the table of contents to the selected HTML page is automatically entered into the Location field. The Topic Details section allows you to edit the name and page location of this topic. Edit the Name field to specify the name of the topic. Edit the Location field to specify the location of a page associated with the topic. This page will appear when the user clicks on the topic element in the Help Contents window. If no page is specified, a default Help page is automatically generated by the Help system at runtime. The Link Details section allows you to edit the location of a linked table of contents file. Edit the Location field to specify the location of a table of contents file to link. The elements in the linked file will replace this link in the table of contents when the user views the table of contents in the Help Contents window. If the path specified in the Location field refers to an existing table of contents file, then clicking on the Location hyperlink will open the page in a default editor. 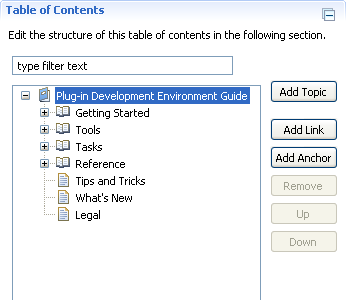 If the path refers to a file that does not exist, or if the path is empty, then clicking on the Location hyperlink opens a New Table of Contents Wizard, which allows you to create a new table of contents. In the wizard, the File name field is automatically populated with the file name from the Location field (if specified). If a valid folder path is specified in the Location field, then this path is automatically selected in the wizard as the location of the new file. Click the Browse button to open the Table of Contents Selection dialog, which allows you to select an existing table of contents. The dialog presents a hierarchical view of tables of contents contained within your workspace. After a selection is made, the relative path from the project to the selected table of contents is automatically entered into the Location field. The Anchor Details section allows you to edit the identifier of this anchor. Edit the ID field to specify the identifier of the anchor.